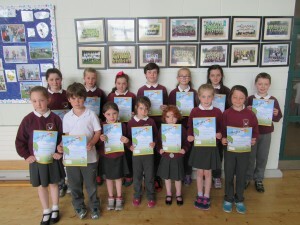 Ghlac páistí na scoile páirt i gcomórtas Scríobh Leabhar Gaeilge ar na mallaibh. Seo griangraf de na páistí a bhí i láthair ag bronnadh na nduaiseanna i nGort a’ Chorice. Print article This entry was posted by Admin on June 19, 2015 at 9:09 am, and is filed under General. Follow any responses to this post through RSS 2.0. Both comments and pings are currently closed.